Uses advanced ultraviolet, magnetic ink, infrared and size detection methods to defend against potential counterfeit bills. Easy for anyone to use thanks to the 4-orientation counterfeit detection: Can verify a bill in any of the 4 orientations possible for instant verification. Takes security one step further: clearly confirms the denomination of the bill on its TFT screen to protect against bleached bills. Counts and defends against fake bills and displays the full count report by denomination on-screen. The KCD-2000 makes use of a multitude of detection methods to ensure the cash your business receives from customers Is authentic. Far more effective than a simple pen or UV lamp, the KCD-2000 features systems that check the bill for ultraviolet, magnetic ink, infrared and size security features to ensure it is authentic US currency. In addition to powerful counterfeit detection capabilities, the KCD-2000 offers simple user-friendly operation. The KCD-2000 can verify bills in all 4 orientations to save time and eliminate the frustration of false rejects due to an incorrect orientation insertion. The large and clear TFT display with the intuitive control panel make the KCD-2000™ the perfect product for efficient cash counting and counterfeit detection. The large, TFT display also shows the denomination of the bill on its screen to defend against bill bleaching schemes that may try to pass off a $1 as a $100. In addition to counterfeit detection, the KCD-2000 also counts the number and the value of bills that have been scanned and displays the full count by denomination on a specific on-screen report. This compact counterfeit detector fits easily in any point of sale environment. 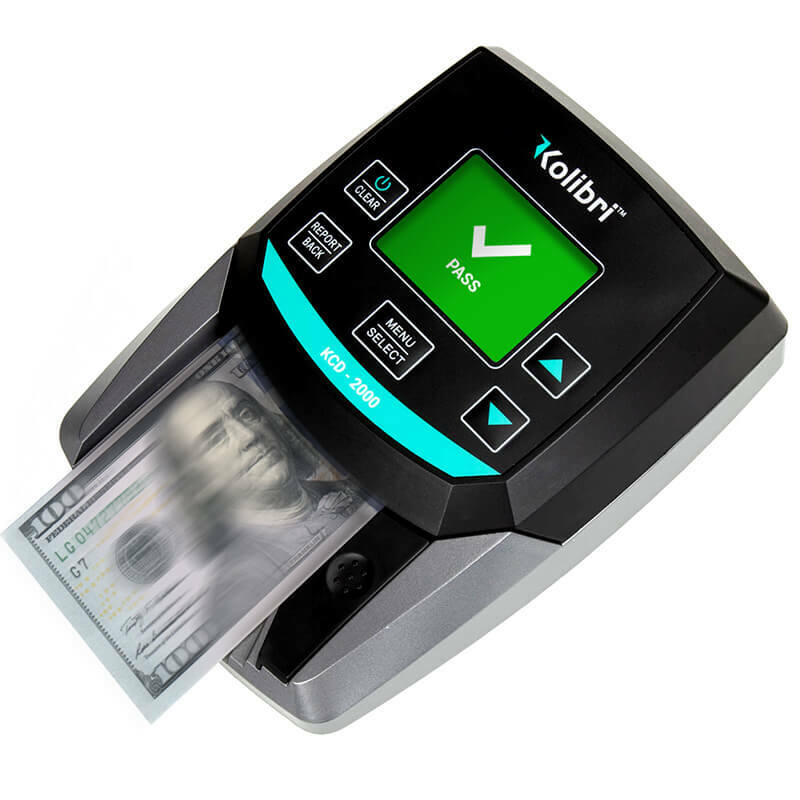 For fast, easy defense against counterfeit money, add the KCD-2000 to your business. Which is better: a counterfeit detector machine or a counterfeit detector pen? On the other hand, an automatic money counter and counterfeit detector like the KCD-2000 is able to rapidly detect counterfeit banknotes, utilizing magnetic ink, ultraviolet, and infrared detection systems. This combination of dependability and convenience, when using both a quality bill counter and an automatic counterfeit detector like the KCD-2000, is vital to any business that receives cash payments on a daily basis. You can buy it online! Just make sure that you purchase a top-quality device you can rely on. 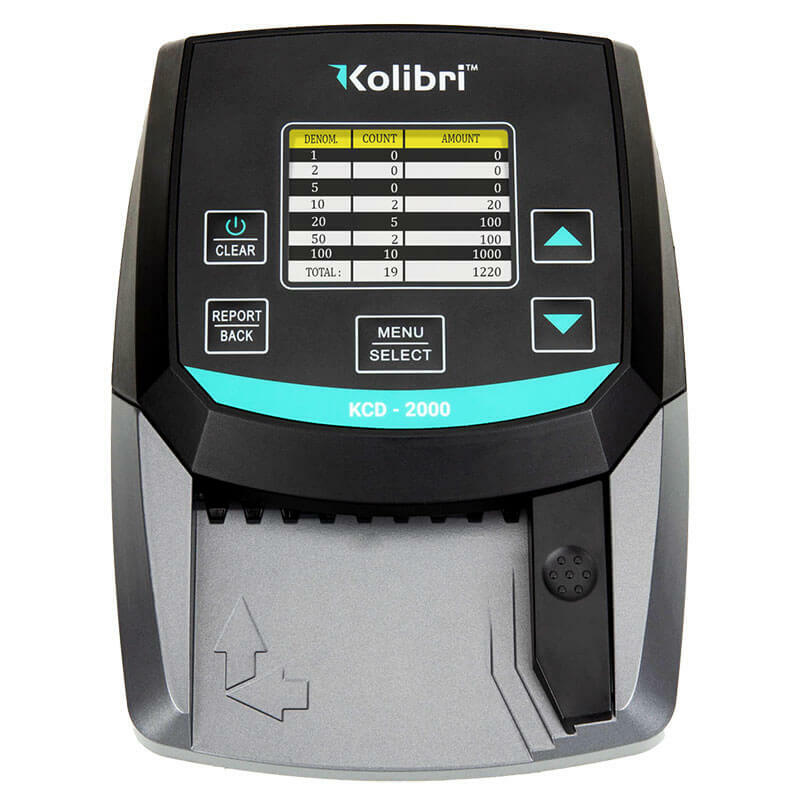 The Kolibri KCD-2000 is a premier counterfeit detector that adds extra convenience thanks to its ability to correctly scan a bill regardless of which side it’s inserted in. It weighs 1.3 lbs (0.59kg), and its dimensions are 6.9” x 5” x 3.2” (175mm x 128mm x 81mm). 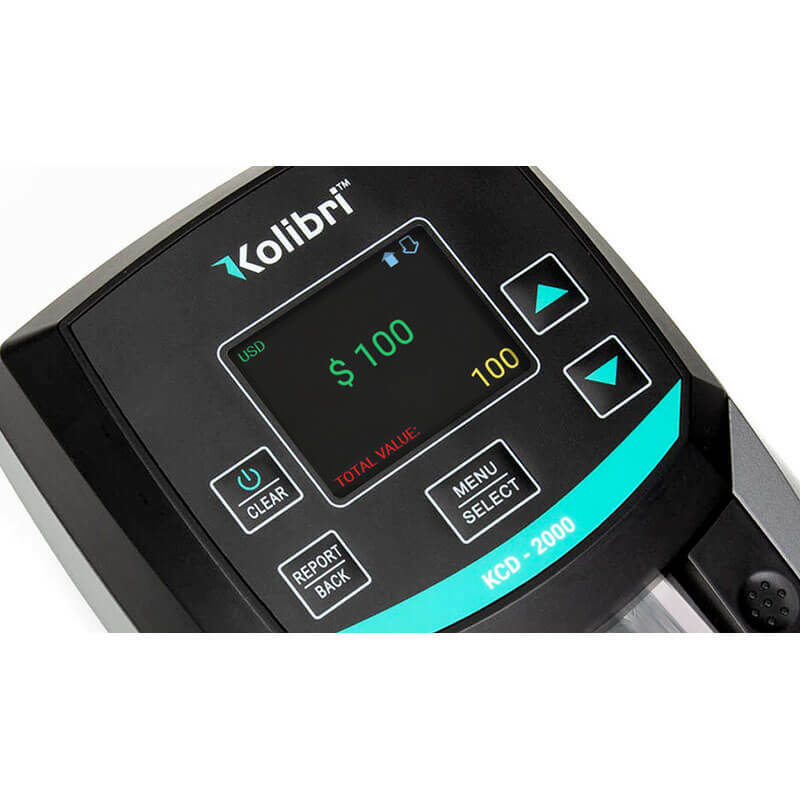 The KCD-2000 automatic counterfeit detector, which can also function as a bill counter, can be ordered online, via the Kolibri USA website. We will redirect you to Amazon.com so you can make the purchase. It does. Like other Kolibri products, the KCD-2000 comes with a 1-year warranty from the date of purchase. This warranty protects the owner against manufacturing defects, and unit-related failures that occur during normal operation while observing the specific guidelines outlined in the product manual. Kolibri USA counterfeit detector devices are an effective and convenient solution for any business that regularly processes cash payments. These products boast attractive features, such as light weight and durable and compact design. 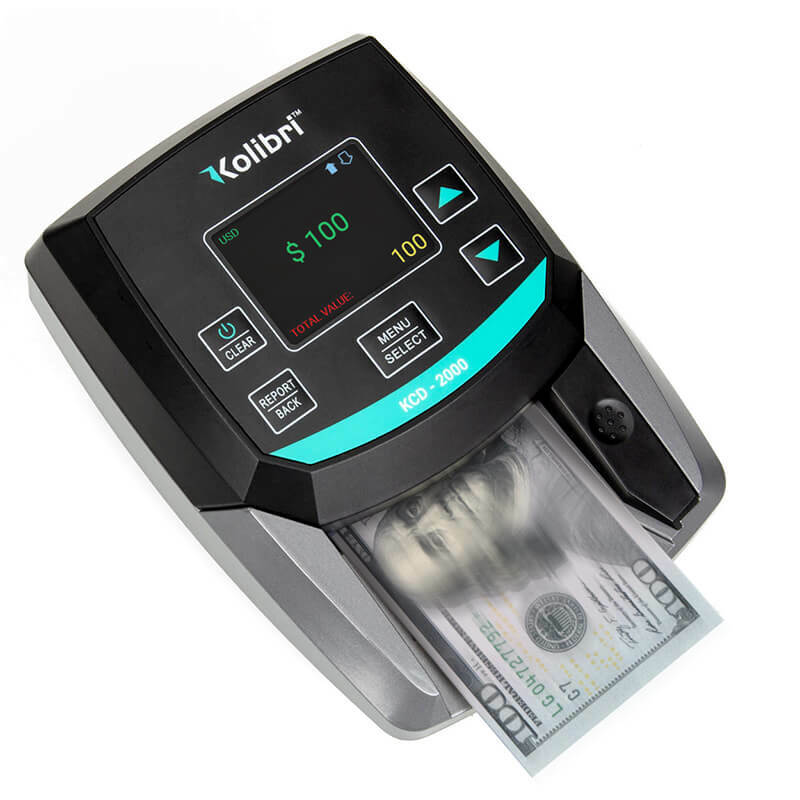 Combined with a cash drop safe or a large cash box in store, this automatic counterfeit detector from Kolibri is a product that promises lasting functionality. It’s all you need to successfully run a business such as a dispensary, salon, or restaurant of any size.